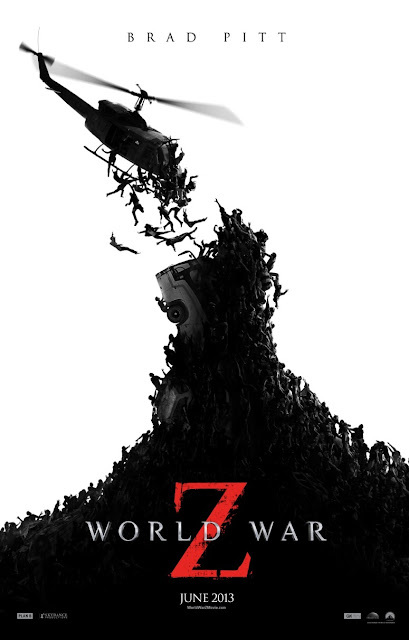 Fruitless Pursuits: Review: World War Z! If you’re the kind of fan who reads a lot of movie news then you may be entering World War Z with at lease some degree of trepidation. WWZ allegedly had a long, expensive and troubled production, resulting in multiple reshoots and a reworked ending, and much has been said as to whether it really has that much in common with Max Brooks' original book. However, as the film began, most of those concerns dissolved as I was immediately swept up into the writhing, undead sea of the oncoming zombie horde. World War Z wastes no time in getting to the good stuff and begins with such a tense, relentless pace that you can’t but help to let your expectations go and just see where it takes you. And I respect a film that delivers on its promise of a global zombie catastrophe within the first few minutes of its running time. But the real test is: Is World War Z sustainable? Can it keep up that pace and continue to surprise us for nearly two hours? I’m going to share my thoughts on what they got right, and what went wrong... after the jump! Firstly, do we need another zombie film? I think we do if it can do something different, and WWZ definitely has some new tricks up its magazine-taped sleeves (that’ll make sense when you see it). If you’ve viewed the trailer than you’ll already know that this unique take on zombies is instantly irresistible. They swarm like ants at a picnic, rapidly devouring everything in their path and continually adding to their clawing and screaming mass. They hit like a tidal wave and there’s an almost tangible helplessness whenever they’re around. You can’t stand your ground and fight these zombies. As soon as they appear, EVERYBODY runs. I also enjoyed the speed at which these zombies turn. Once bitten you have around ten seconds and this really helps to raise the stakes and keep the adrenaline pumping. I also don’t think we’ve ever seen this kind of incident go down on such a global scale. We spend our fair share of time in the United States as things steadily go from bad to worse, but our investigator hero, Brad Pitt, also spends considerable time in South Korea, Jerusalem and Wales. The constant change of environment is welcome and the zombie attack on the sun-drenched and wide-open Jerusalem has to be the highlight of the film. It strays from dark claustrophobic zombie tropes but still manages to scare. This is WWZ at its most confident. The zombies certainly have a visceral impact and, despite the film's over reliance on some typical (but effective) jump scares, I think it’s surprisingly inventive in creating varied and memorable scenes of zombie mayhem. The only occasionally distracting thing is that the more intense violence is very obviously cut around - the more horrific events are implied, either happening off screen or completely cut away from. And these cuts can be quite fast and difficult to follow - especially in 3D when your eyes often need time to adjust. It did pull me out of the film on occasion as it doesn’t serve the story, but rather serves keeping the film’s rating as unrestrictive as possible. It’s a bloodless affair which may have been a little more involving in bolder hands. Similarly, I don’t believe there’s anything particularly gut-wrenching or emotional here. You’ll find far more pathos and difficult decision making in just the first episode of The Walking Dead. This film is purely about action spectacle. The only human element stems from Pitt’s bond with his family (who he must temporarily leave in order to help hunt down Patient Zero) but I never really ever felt like any of them were in danger. That said, Brad Pitt is a very likeable protagonist and I’m glad that it is a presence like his that is carrying this film. Also of note are the snippets of monologues from Brooks' book, all of which are engaging and elevate the proceedings. There’s some great writing in these parts, and I found the South Korean sequences particularly chilling and riveting. So, to be honest, it’s all going very well and I’m sitting there having a blast with this movie, delighted as the conflict continues to escalates, excited to see where the story takes me, and ready to unreservedly recommend this film. So what the hell happened in that third act? Which is not to say it’s by any means terrible, but the third act marks a jarring change of scale and pace. The film suddenly becomes very small and unambitious, completely jettisoning the “World” and “War” from the tile. We shift from CGI spectacle into something that feels like a 30 minute TV episode. In fact there’s really little here that talented film students couldn’t make in an empty university with a video camera and a few friends - and even then I think that their lecturer would have told them it needed an edited. We know Pitt’s plan by this stage but it’s all far too protracted, prompting the stranger sitting to my left - who had been absorbed up until this point - to bellow, “Too slow!” at the screen. Perhaps an unfair statement, because there’s still some great performances and effective tension, but it’s definitely an about turn. It doesn’t help that it’s set in Wales and the vest and cardigan wearing zombies look like they work at the Ministry of Silly Walks. Our audience - who had been shellshocked up until now started giggling at these guys. The film then sheepishly ends with a very rushed montage, not ever really giving us the gigantic climax I had hoped for. It’s only because things were going so well that this hit me so hard. It feels like the ending you get when the money dries up. And it’s a real shame because this is otherwise a really entertaining film where the good outweighs the bad. I do still strongly recommend it, especially if you’re a fan of the genre, and definitely on the big screen so that you can truly enjoy the crazy density of some of those shots. In fact, if you’re prepared for the shift in pace and scale then you may even enjoy it more - it just took me unawares. I would love to see a follow up where the filmmakers could really unleash. And hopefully there’s a harder (and maybe leaner) cut on Blu-ray? I’ll be curious to know what you think. There's a moment after the plane crashes (another fantastic scene) where everything goes black for a few seconds. Run the credits there instead! Then you have a tight, intense, kickass awesome 90 minute zombie movie. (Although admittedly a depressing one). World War Z is a string of unrelenting, harrowing sequences that continually manage to top one another.